Concrete, pull through spots are about 50 ft. long. Streets are wide enough to park in front of or in back of rig. My spot had a metal table, four chairs, BBQ and fire pit. There is an excellent club house that can be used. We had two days of heavy rain, but the park drained well. This park had the best showers I have ever seen. The staff was very helpful with our RV group. 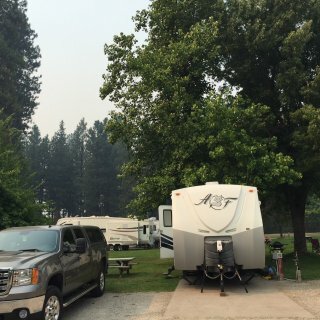 We camped at Oroville / Feather Falls Casino KOA in a Travel Trailer. The Feather Falls Casino Brewery, had good beer, excellent food and reasonable prices. The Feather Falls Mini Mart, part of the reservation, had an excellent price for diesel. Had a dirt & gravel back in site. Needed to level the trailer, one inch, side to side. Park was very wet due to heavy rains. AT&T did not work in campsite and was intermittent up the hill at the office. Verizon worked much better. I could only hook up to WI-FI at the designated WI-FI spots. Was led to spot by staff. Cable TV was excellent. Great fire pit was supplied. We stayed 3 nights and got a fourth night free. We camped at Smithwoods RV Park in a Travel Trailer. Very convenient to Henry Cowell State Park and Roaring Camp Railroad. It was just over a five mile drive to the Santa Cruz Boardwalk and Wharf. Had a flat, level, concrete, pull through site with grass on both sides. Was not able to connect to internet even though WI-FI showed 5 bars of connection. Got more TV stations, that were much clearer, using an antenna rather than the park cable. Swimming pool and spa was good. All low spots of grass were swampy due to heavy rains. The dog park was over grown. The golf course doesn't exist any more. We camped at French Camp RV Park Resort & Golf Course in a Travel Trailer. There is a sports bar when you enter the campground. Food was good and prices were OK. I had a flat, level, concrete, pull through site. There was grass on both sides and a concrete picnic table. There were two trees on the site. I stayed 12 nights to work the Reno Air Races. Price per night reflects Good Sam Discount, regular rate and special event rate. WI-FI and AT&T pine service worked fine. A dirt dog run worked well for my dog. My only issue is the sprinklers flood the sites when they come on. We camped at Bordertown Casino RV Resort in a Travel Trailer. The restaurant in the Casino has decent food at a good price. Had a back in site with a concrete slab to park my trailer on. Needed to raise driver's side of trailer 1" to level trailer. Had a gravel pad to park truck on. There was a wood picnic table at our site. My site had a good combination of sun and shade. There is a $1.00 a day pet fee. The sewer drain is raised about 6 inches from the ground. I had to work to get my sewer hose to flow downhill. There was roadway noise from Highway 89. AT&T phone service worked well. Park WI-FI allowed checking emails and writing this review. 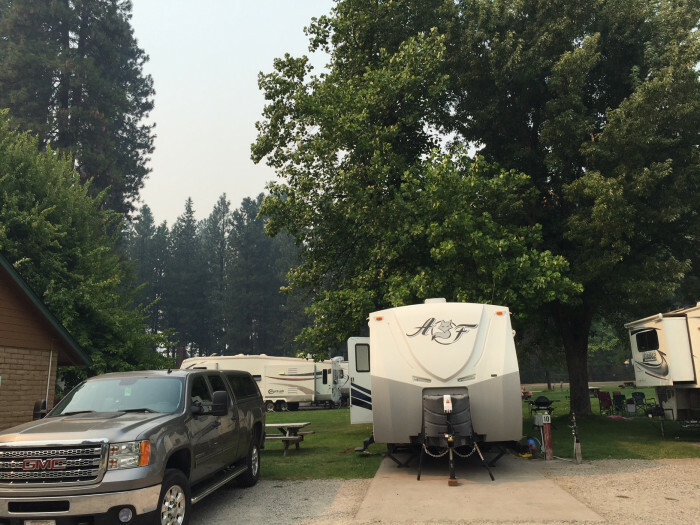 We camped at McCloud RV Resort in a Travel Trailer. Nice base to see McCloud, Mt. Shasta City, Mt. Shasta Ski area, Weed and fish McCloud River. There is a small Pizza Pub just outside the Park entrance called Siskiyou Brewery Works. The is an easy walk and I liked the Pizza and homemade beer. The check in process is slow and strange. You are not assigned a spot, you locate a spot and tell the office where you are. The road start out asphalt and are then becomes dirt and rock. The dust is horrible and care has to be taken when driving on the roads to not strike tree branches. Backing into a spot was difficult and a spotter was definitely needed. I had to raise my rig 3 inches to come close to level. I was with two other rigs and all our spots were very un level. The sites have water and electric. There are two dump stations when leaving. No charcoal BBQ's or propane fire pits were allowed. My spot was not wide enough to open my awning or park my vehicle without lots of maneuvering. The picnic table we had was falling apart. I will not return. We camped at Thousand Trails Snowflower Resort in a Travel Trailer. Had flat, level, gravel, back-in site. Rate was $50.00 a night plus $1.00 a day for the dog. There is a long list of chemicals you cannot dump into the sewer system. Basically anything with Formaldehyde and Phenol is prohibited. A dump station is provided to empty your tanks when leaving. My space backed up to an arbor with a club house. WI-FI and cable TV were good; AT&T had only one bar but worked OK. Interior roads were OK. Exit was a little hard to figure out but the traffic pattern was OK. Good swimming pool and off leash dog parks. We camped at Vineyard RV Park in a Travel Trailer. The Jelly Belly Factory Tour and Budweiser Brewery Tour in Fairfield were very enjoyable. Many people in the park were here for their child's graduation from UC Davis. We had a back in level spot. The staff helps you back in, so setting up on the narrow circle is not difficult. WI-FI worked well. AT&T works in park. The park provided hot dogs & chili on Friday night. Rigs are close together, all utilities work and the staff is very helpful. Location can't be beat. Use the directions on the website to get to the park. We camped at 49er RV Ranch in a Travel Trailer. Columbia State Park is an easy 1/2 mile walk away. The drive from the entry gate to my spot was 1 mile. The road was wide but in terrible shape. The road was full of potholes and uneven dirt and gravel. There was a water spigot at the site and a filthy picnic table. We were on the seawall, the view was spectacular. The site was very uneven and I needed 3 inches of blocks to raise the low side of the trailer. I was told when making the reservation, there were no refunds but a credit would be given to be used in the calendar year. There were two dump stations to use when leaving. AT&T worked well. I could not hook up to the WI-FI. The scenery is beautiful, the campground is extremely over priced. The last morning I woke up and the campground was full of cows. We camped at Lawson's Landing. in a Travel Trailer. Had a level, gravel, back it site. There was a concrete patio next to the trailer. There was a spot to park my truck next to the trailer. There was no cable. Over the air TV had 5 english speaking channels. AT&T worked well. Wi-Fi was free but very slow. There was no picnic table at the site. Interior roads were asphalt and easy to maneuver on. The dog park was too far from our site to be useful. We camped at Fortuna De Oro RV Park (55+) in a Travel Trailer. Had a flat, level, pull through spot. The spot was long enough that I did not have to unhook the truck. Cable TV and Wi-Fi was excellent. One of the great things about this time of year is that you can pick oranges in the park. We were supplied an orange picker on a pole so we could each oranges high on the trees. Delicious oranges. Great place to stop. We camped at Orange Grove RV Park in a Travel Trailer. Had a flat, level, gravel, pull through spot. Total length was about 70 feet. The staff was very friendly and helpful providing directions to save time driving to a club Christmas Dinner. The gravel was packed down and as long as people drove slow, I saw no dust. There is a decent, fenced in dog park with three trees, grass and dirt plus a pooper scooper. Good place to spend a night or two. Heard a few trains, but not a major issue. I would definitely stay here again. We camped at Cal Expo RV Park in a Travel Trailer. I picked a gravel, pull through site. There were rocks and trees on both sides of site. It took a 2 inch board to level trailer, side to side. Site is fine for an overnight stay. We camped at RV Park at Rolling Hills Casino in a Travel Trailer. I ate at the "Lounge" in the casino. The food was good, the prices were reasonable. Had gravel, pull through site. It took one 2" board and one 1" board to level the trailer side to side. There is grass on both sides of site. WI-FI and AT&T work well. Camp K-9 was full of stickers. Only used it once. Cable TV worked well. Nice small pool and play ground. Very smoky from forest fires. Office staff were friendly. There are trees that will provide shade depending on the location of the sun. My rig is 50 ft long when connected. Site was long enough that I did not have to disconnect the truck. Would stay here again if traveling on I-5. We camped at Medford / Gold Hill KOA in a Travel Trailer. Had a flat, level, gravel site with grass on both side of the site. Had electric and water. Plug was 50 amp so need an adapter to downsize to 30 amp. Trees in area. Free dump site when leaving. AT&T worked well. WI-FI was excellent. Heard trains passing through. We camped at Riverbend Campground in a Travel Trailer. The RV park is well signed from the freeway. You have to pass through a 14 foot tunnel just before you get to the park. Tunnel did not look that high, but a 13'6" rig in our group fit with no problems.